Looking for School Uniforms for your children in Maryland, DC or Virginia? 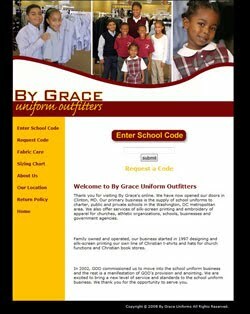 By Grace Uniform Outfitters is your answer! By Grace carries both Logo and non-logo items for public and private schools. Beat the rush and order online. Items can be shipped or picked up in the store. There are TWO stores for your convenience, one in Clinton (logo and non-logo items) and a satellite store (non-logo items only) in Largo. you’ll want to choose By Grace Uniform Outfitters.